Everyone loves a dragon. I think there was a time in my childhood when I thought they were real. Just very, very rare. That’s right – they used to hang around with the unicorns. Oh, how my literally ‘fantastic’ world was shattered when I was told, rather aggressively, that they didn’t exist (that conversation might have taken place last week). But, did they exist? Were they simply very big eels with bad breath which existed in the middle-ages – eels that someone told a bit of a stretcher about down the local tavern to his drunken mates to show off? “Yeah, slayed a dragon down near Black Pond yesterday. Fierce brute. Fiery breath. Nearly did for me”. And the reality? Some fat bloke in armour wrestling an eel in some grass. Perhaps we’ll never know. Anyway, here are some of the dragon hotspots of Europe, where the mythology is strongest. 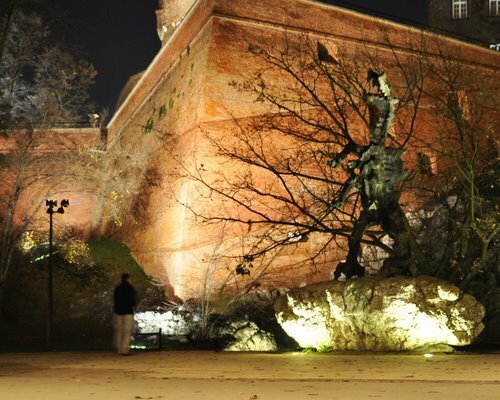 On Wawel Hill, in Krakow, Poland, is a huge hill with Warsaw Castle perched on top. The medieval city of Krakow – and Poland’s original capital – meanders around beneath it. Many different stories exist. This is just one of them. When that place ‘was all just fields’, stories would be told to wide-eyed children of a fearful beast which dwelled in an overgrown cave somewhere in the rock. The creature was known to carry off a sheep or two here or there, perhaps a man or a child on occasion. It had to stop. Yet no-one was a match for this ferocious monster. Until a shoemaker called ‘Krakus’ had a pop at it. He basically fed the dragon a poisoned sheep. Once the slithery character had been killed, the locals made Krakus king. They built him a castle and renamed the area Krakow in his honour. 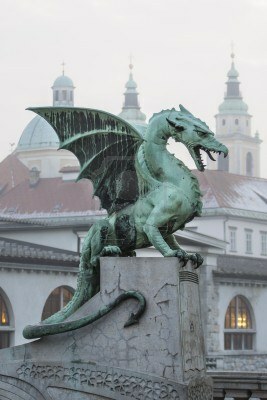 A small statue of him and the dragon can be see on Sienna Street, Krakow. A collection of huge bones, suspended above the entrance of the castle are said to be the bones of the dragon. Nowadays, beneath the citadel, you can see a statue of the beast outside of the cave supposed to have been its lair. It breathes fire every few minutes (thanks to some natural gas and a nozzle in its mouth). What’s more, you can even make it breathe fire by sending an SMS with the word ‘SMOK’ to number 7168. See the location on TravPad here. In the most southern part of County Durham, there’s a curious loop in the River Tees – at this point, it seems Durham is bulging as far south as it can – like an inflating balloon – into the southern neighbouring county of what used to be part of Yorkshire. This area is ancient. 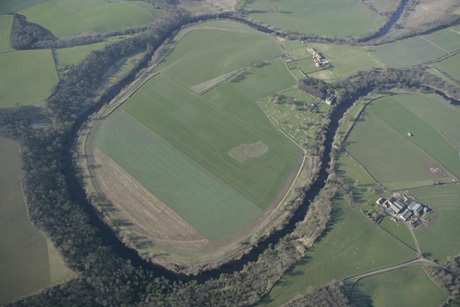 The ‘loop’ which has been formed in the river, encircles an area of land which is only entered by land at the ‘neck’ of this loop. This entrance to the wider territory is small – less than a quarter of a mile across. The current owners of the hall are restoring it and do not seem to encourage tourism. This just makes the area more enigmatic. 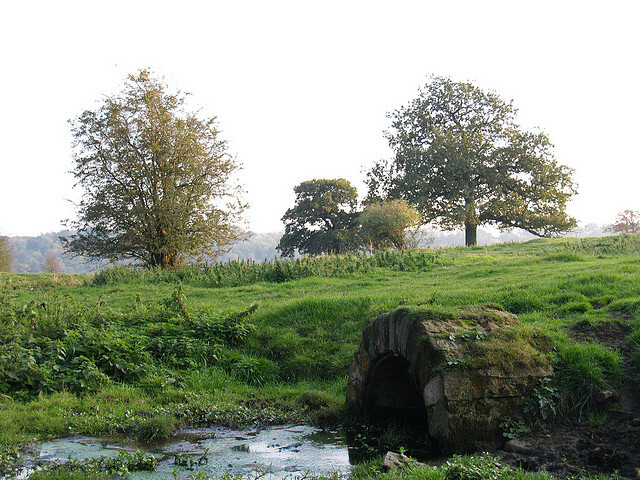 Sockburn was an area ravaged by a “…worm, dragon or fiery flying serpent…”. This story was said to have inspired Lewis Carroll (who grew up at the nearby village of Croft) to write his ‘Jabberwocky’.Although the details of the scrap between the knight Conyers and the unlucky beast are scant, the remnants of what is supposedly a myth are suspiciously rich and numerous. The spring where the dragon used to bathe is still there and visible. The ‘Grey Stone’ beneath which lie the remains of the beast is still also partially visible. There is an effigy of Sir John Conyers in the ruined and ancient church there, with the dragon wrapped around his feet, as it must have been for centuries. 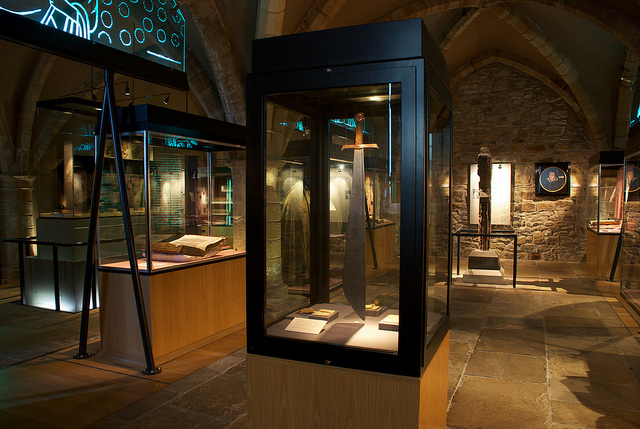 The extremely rare Conyer’s Falchion (a type of old sword and the best surviving example of its type in the world), used to actually slay the dragon, still exists and can be seen in Durham Cathedral treasury (see location on the TravPad map). Read more about this fascinating area on TravPad here. Given the actual importance of what is said to have happened here, the fact that most English folk haven’t even heard of this place is staggering. Even I hadn’t heard about it until a few months ago. 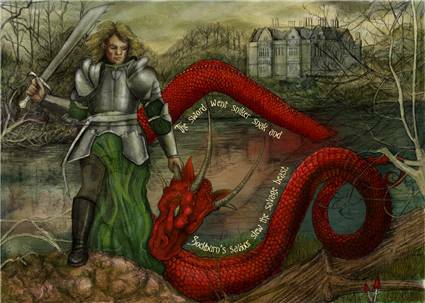 For the tiny village of Brinsop was the location of the epic battle between a knight called St George and a now quite-well known dragon. 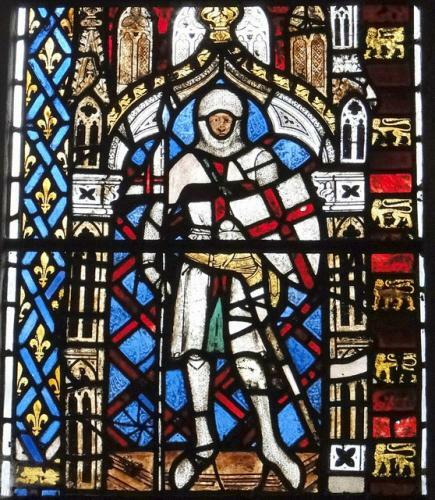 The knight has become the patron saint of England. The dragon could only hit ‘A-List’ historical/cultural-celebrity-status by being killed. Like the Sockburn beast, this dragon based itself near a water-source in a grassy meadow in the village. 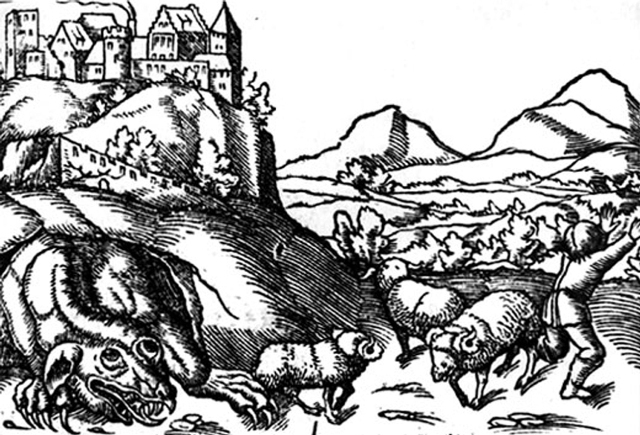 Plainly, the villagers didn’t like it roaring around, breathing on everything, burning their crops and eating their sheep. And their relatives. George was called in. And he slew it. And that’s a very long story, told in a very tiny nutshell. 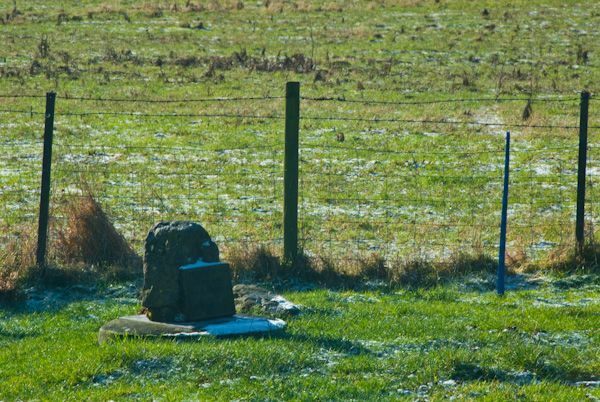 The stone shown above, buried in a meadow just south of the small churchyard of – yes, you guessed it, St George’s Church – marks the spot where the creature was said to have been killed. See the location on TravPad here. The reason the bridge has dragons on it is simply because the Greek hero Jason (and his sword-happy argonauts) supposedly killed a dragon not too far from the city. Fresh from relieving the Colchians of their golden fleece (and reportedly killing a dragon which had been guarding it), Jason legged it, only to be pursued by a huge army. In an attempt to give them the slip, he took a turning up the River Danube, on up the River Sava and eventually up the River Ljubljanica almost to its source. They took the boat to bits, marched it across to the Adriatic and carried on their way. Somewhere between Ljubljana and Vrhnika these cheeky mythological chappies encountered a marsh. Guess what was living in the marsh? Yes, a dragon. Having battled a substantial number of monsters already, this wee swamp-beastie was dispatched without breaking into a sweat. It is now immortalised by one of the dragons on the bridge. If you have any dragon related spots, please either tweet them to us, send us a comment on this blog, or place them directly on the TravPad map!